The protagonists of this story are mushrooms with human characteristics that live quietly in the countryside until a shower of bubbles has trapped the smallest of the village. Our friend will have to use those same bubbles to save the children in each of these levels and get them back safe and sound. 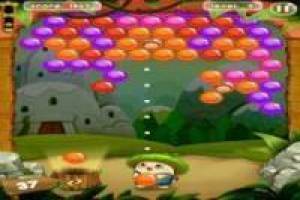 It is a Bubble Shooter game in which you will have to use your mouse to aim and shoot the colored bubbles towards others of the same color to eliminate them. 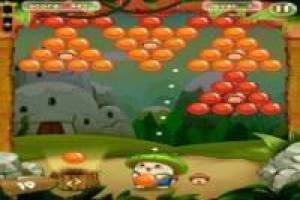 You do not need to eliminate all the bubbles, your mission is to save the small mushrooms and once you get it you will overcome the level. If it is better for you to use the following bubble than the current one press the B key to make the change. 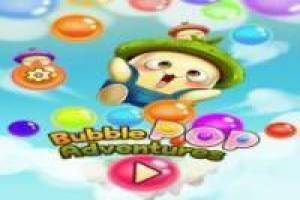 Enjoy the game Bubble Pop Adventures, it's free, it's one of our Bubble shooter games we've selected.